Modern Tribe is a cool Judaica and Jewish specialty shop. But within this adorable web site hides some unique picture frames that we wanted to to share! And with the holidays not too far away....we think these are great gifts to give! Be sure to include a picture in the frame for the recipient for an added personal touch. You know how hard it is to find a cute picture frame with a Jewish twist. (Try Googling for a bar or bat mitzvah picture frame - oy!) Create your own. Plus you can change as you please as many times as you want. A frame that you can truly make your own. Comes with an 80 page sketching pad and photo opening for a 4x6" photo. By Umbra. This ultra sleek 4 x 6" (10 x 15 cm) Umbra Fonti Frame comes with 141 attachable, assorted letters and numbers (white) for the ultimate in personalization. The perfect gift for men, teens, dorm rooms and more! 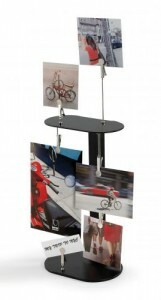 The Seto is a fun way to display your photos, postcards, notes, even business cards on a tabletop. The metallic black stand has six magnetic metal clips to grip items. Create a personalized gift for Dad by adding your own photos, notes, and memories. The perfect back to school gift! Inspired by antique frame contours and traditional textile patterns, Framework magnetic frames adds flair to even the most ordinary metallic surfaces. 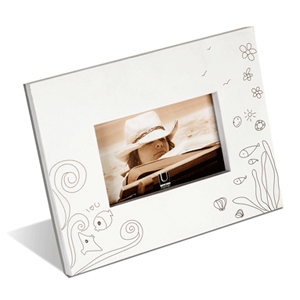 Whether placed on a refrigerator, a file cabinet, or inside a school locker, these lightweight, yet durable frames hold photos and keepsakes in place securely and with style!